Congratulations! You win 127 bonus points with this purchase! Ever Clean 350 ml is a cleansing and disinfecting peroxide solution suitable for all types of soft and rigid (RGP) contact lenses. The solution is preservative-free which makes it suitable for extremely sensitive eyes and more demanding conditions. 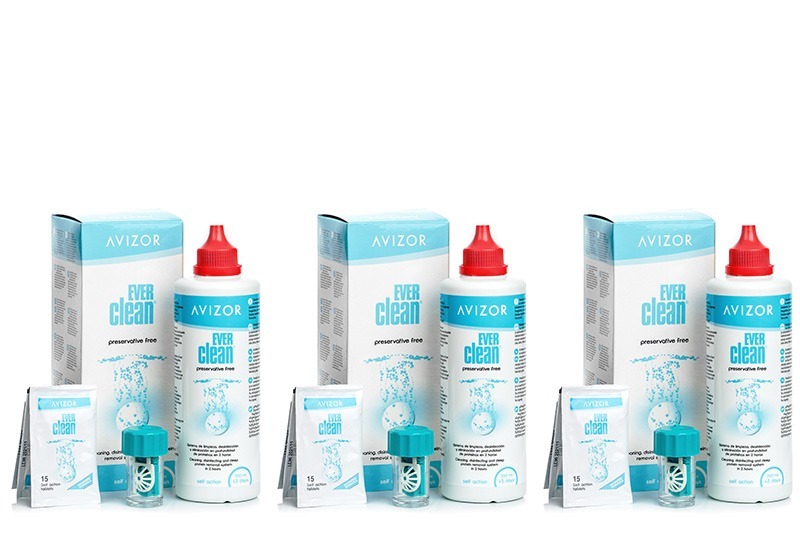 The Ever Clean solution meets the expectations of those contact lens users who seek maximum comfort and safety for their eyes. Maximum cleaning effect is achieved with the help of the two-step tablet system. Thanks to its composition, the concertation of active oxygen during the first cleaning phase reaches maximum level – double of what peroxide systems with platinum catalyst may achieve. The outer white component starts the cleaning process immediately after being inserted in the solution and removes proteins deposited on the lens' surface efficiently. Subsequently, the inner green component starts dissolving slowly and enables the disinfection of lenses and deactivation of hydrogen peroxide. After the two-hour process, the originally transparent solution of hydrogen peroxide turns into saline. The slightly green tint signals completion of the disinfection process. After the neutralization is finished, the lenses are disinfected, clean, neutralized and ready to use. The solution comes with a special barrel case and two-layer cleaning tablets. Non-neutralized solution must not come into contact with the eye! After removing the lenses, empty the case, rinse with Avizor Saline Solution and let it air-dry.